As I plodded away on the treadmill the other day the Australian Open tennis match was on the television at the gym. I love watching tennis. My thoughts meandered over to the fact that this is a leap year and that means the Olympics! While I’m not normally much of a sports fan I do love watching elite athletes, especially when they’re doing stuff that I can’t even imagine doing. (Hey, it’s boring on the treadmill, my thoughts go all over the place). 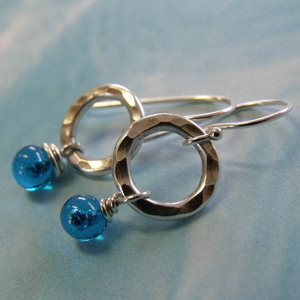 This month I’m giving away my most popular earrings, the aqua bobble ring earrings. My personal favourites. Tell me what’s the Olympic sport you’re most looking forward to watching? To enter the giveaway: email me at catherine@sailorgirl.comand tell me what’s your favourite Olympic sport. ps. bet you thought I’d be giving away some red heart jewelry!